Chicken-fried steak is one of the most Texan foods out there. Despite the name, chicken-fried steak isn’t some turducken Frankenstein product. Traditionally it’s flattened cube steak battered, fried, and served covered with country gravy. In other words, it’s a steak fried in the manner of fried chicken. Sometimes it’s made with chicken instead, and you end up with chicken-fried chicken. Which is nothing like fried chicken. If you’re not from around these parts, you might call this dish country fried steak. And we’d probably let it pass. Just because a Texan doesn’t eat meat anymore, it doesn’t mean they have to give up battering, frying, and gravy-ing their food. And when you’re vegan, the sky’s the limit for chicken-frying. If you can flatten it, we can chicken-fry it! Here is a round-up of vegan chicken-fried recipes from Texans and honorary-Texans around the Web. Shown at the top of the page, Morgan at Little House of Veggies chicken-fries seitan, though she suggests Gardein scallopini would work great instead. Don’t be fooled by the spinach in her photo, this is pure comfort food. Chow Vegan shares a recipe for Chicken-Fried Portobello Mushrooms. Not into frying? She has a recipe for baked chicken-fried tofu with creamy gravy that’s lighter in calories and oil. 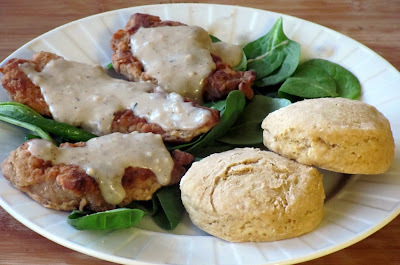 If you’re looking for something more traditional, Bok Choy Bohemia has a recipe that’s got her reaching for her seldom-used steak knives: Chicken-Fried Seitan. And if you’re ambitious, Soundly Vegan has step-by-step instructions for homemade Chicken-Fried Tofu Steak starting by making your own tofu. There’s a recipe for mushroom gravy to go with it, and while that’s not a Texas tradition, it looks tasty. If you’re a little less ambitious, Ellen Degeneres has a recipe for Chicken-Fried Steak Bites using Gardein. Enjoy them with a twist on the traditional white gravy: cashew gravy. And finally, Austinites Cristen and Miguel out-Texan everyone with a post about chicken-fried seitan breakfast tacos at Tomorrow Austin. Have a vegan Texas recipe you want to share or an idea for a recipe round-up? Email us at lonestarplate (at) gmail.com. This entry was posted in recipe round-up, recipes, tacos, texas, texas cuisine, vegan by mollyjade. Bookmark the permalink. definitely called country-fried where I’m from (rural northwest Georgia).